Be the first to share your favorite memory, photo or story of Clara. This memorial page is dedicated for family, friends and future generations to celebrate the life of their loved one. 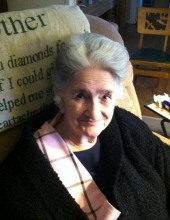 Clara Elaine Meadows, age 90 of Cleveland, Texas, passed away Saturday, April 6, 2019. She was born March 15, 1929 in Danville, Arkansas to parents Oscar and Effie Thacker who preceded her in death along with her husband, A.K. Meadows; and siblings, Marie, Cecil, Cheedle, Fannie, Carl, Iona, Lula Mae, Robert, Oscar Columbus Jr., and Irwin. Survivors include her children, Gary and Brenda Meadows, Jonathan and Mandy Meadows, Cheri Henderson, Lisa and Brian Warman; grandchildren, James, David, Ashley, Elishia, Kevin, Kimberly and Hannah; great-grandchildren, Riley, Emma, Kirah, Jayden, Alexander, Charlie, Briar, Joshua, and Caleb; along with numerous other relatives and friends. Visitation will be held from 5:00 p.m. – 8:00 p.m., Thursday, April 11, 2019 at Pace Stancil Funeral Home, Cleveland, Texas. Services will be held at 10:00 a.m., Friday, April 12, 2019 at Pace Stancil Chapel, Cleveland, Texas. Interment will follow at Pace Stancil Memorial Rest Gardens, Cleveland, Texas. To send flowers or a remembrance gift to the family of Clara Elaine Meadows, please visit our Tribute Store. Interment will follow at Pace Stancil Memorial Rest Gardens, Cleveland, Texas. "Email Address" would like to share the life celebration of Clara Elaine Meadows. Click on the "link" to go to share a favorite memory or leave a condolence message for the family.